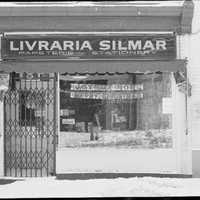 Image of Livraria Silmar bookstore and stationary storefront in Montreal, Quebec. Domingos Marques (? ), “Livraria Silmar - Papeterie, Stationary,” York University Libraries | Clara Thomas Archives & Special Collections online exhibits, accessed April 23, 2019, http://archives.library.yorku.ca/items/show/2209.